Starring Glenn Ford, Valli, Claude Rains, Oscar Homolka, Lloyd Bridges, Sir Cedric Hardwicke, June Clayworth. Every few years a mountain-climbing movie tries to make a comeback, and if the filmmakers have the sense to stay away from Rambo gunfights in the high Alps, they can still be good. Of course, modern effects erase the aura of amazement that comes from watching real climbers scale authentic high peaks. 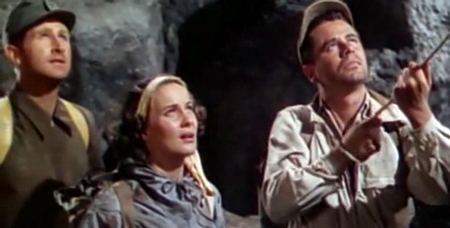 In old movies the stars usually perform against plaster rocks on studio sets. But in the wide shots we can see that people are really risking their necks. 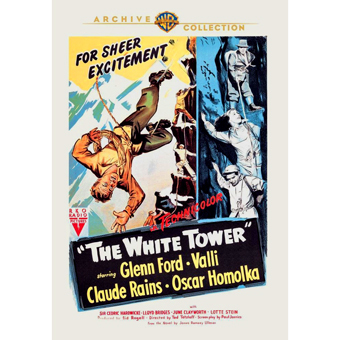 1950's The White Tower was begun in 1947 but delayed after its proposed writer and director team Adrian Scott and Edward Dmytryk were given the heave-ho from RKO for politically inconvenient opinions and associations. Both joined the ranks of the Hollywood Ten and that was that. Writer Paul Jarrico finished a script for The White Tower and then was loaned out to MGM (actually, a European company) to co-write the classic Fred Zinnemann movie The Search. Meanwhile cinematographer Ted Tetzlaff graduated to the director's chair, and scored a modest hit with the next year's The Window. 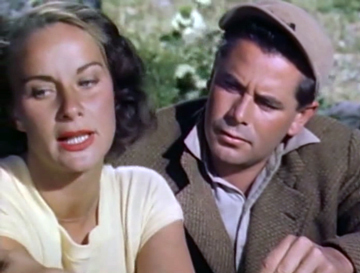 Tetzlaff must have found favor with RKO's new owner Howard Hughes, for in 1950 he was in France directing a Technicolor movie with big star Glenn Ford. RKO occasionally filmed in Mexico but a European location was a bizarre exception. Hughes had just made severe cuts to both production and staff at the Melrose Avenue studio in Hollywood. The war has been over a short time when several 'comfortable drifters' find themselves in the same chalet at the base of The White Tower, a massive, never-climbed Alpine peak. Alcoholic writer Paul Delambre (Claude Rains) hopes to finish his novel about mountain climbing, but has become depressed over a lack of support from his wife Astrid (June Clayworth). Retired naturalist Dr. Nicholas Radcliffe (Sir Cedric Hardwicke) lives in a nearby chalet, but is lonely. Young American ex-flier Martin Ordway (Glenn Ford) crashed in a bomber not far away from the village, and has returned because he misses the peace and quiet of the region. 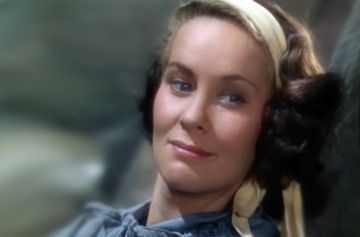 The chalet's owner Andreas (Oscar Homolka) picks up Carla Alton (Alida Valli, or just Valli) at the station. Her famous father was lost during an attempt to scale The White Tower just prior to the war. To finish what he started, Carla hurriedly puts together a new climbing party. The older men agree to accompany her, but Martin is more interested in the girl than the risk, and doesn't see a reason to go. Only when Carla picks up the experienced German climber Mr. Hein (Lloyd Bridges) does Martin change his mind. Most anybody who has hiked in the hills loves mountain climbing pictures. So did Walt Disney, and an early experience for kids my age was watching Disney's exciting Third Man on the Mountain, with James McArthur and Janet Munro. 2 Fresh air, scenery and an escape from worldly problems sounds great whether in real life or on film. The White Tower takes us back to the basic old answer, that mountain climbers climb a mountain, 'because it's there.' Carla Alton is still attached to Papa and can't yet move on with her life. She's been doing refugee work for several years (shades of Jarrico's The Search), and is re-energized by her return to the chalet. 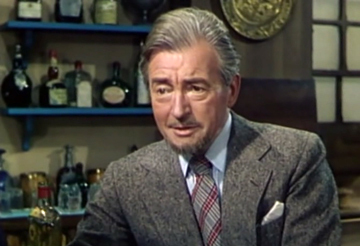 Claude Rains' Paul Delambre welcomes the opportunity to escape his nagging wife for a few days. Dr. Radcliffe signs on, in a less specific spirit. And Martin Ordway admires Carla and plays hard-to-get. Since we know that star Glenn Ford won't be left behind sipping hot chocolate, his Martin stays cool and non-committal while working himself up to kissing status with the gorgeous Carla. It took actress Alida Valli years to recover from her bonded servitude to David Selznick. He and Alfred Hitchcock launched her as the frostiest, least appealing leading lady ever in the stillborn The Paradine Case. Even in Carol Reed's The Third Man, Valli plays a humorless Displaced Person, and mainly mopes and frowns for 100 minutes straight. Seeing Carla's rosy face bursting with timberline smiles gives the actress an entirely different image. We look forward to seeing these characters' strengths and weaknesses revealed, as that's what movie mountains are really for. The story ignores the fact that several cast members including burly Oscar Homolka, don't look fit enough to climb three flights of stairs. In fact, we'd think that Carla and presumed beginner Martin could use some practice and training. Sure enough, on the ascent the professor and the author voice some well-chosen philosophical thoughts. Martin stays quiet, learning as he goes; at first he's only going to haul supplies to the first camp, and wait there while the others proceed. But the challenge comes from Hein, the blonde climbing pro. Hein starts to grouse about various slowpoke comrades that are holding back his individual achievement. He sulks and simmers when Carla emphasizes group effort, that everyone should help everyone else. Nope, it's not long before somebody refers to Hein as a superman, and the climb becomes a contest between conflicting ideologies. Hein's skill is undeniable, as seen when he gets over a stretch of rock that even Andreas says is impossible. As the holdouts/survivors near the top, our 'quiet' American finally rises to challenge Hein's claim of superiority. Freelancer Claude Rains was sixty years old but still had fifteen years of good performances to offer; Oscar Homolka was 53 but looked much older, not counting those bushy eyebrows that seem capable of swallowing other performers whole. June Clayworth has the thankless role of the tormenting wife. But her performance is good enough to excuse the fact that she's producer Sid Rogell's missus. Glenn Ford plays to his strengths, keeping his hero unflappably calm throughout the picture. His passive hero puts a spin on the film's message, that American self-assurance is another form of superiority. There is no overt pro-American message, just a firm 'no' to Mr. Hein's claim to a higher destiny. Those peace-loving Yanks are apparently the inheritors of the Earth. The Warner Archive Collection DVD-R of The White Tower is a fairly good rendering of this vintage Technicolor picture, perhaps taken from a reasonable if not perfect composite element. Colors are rich but the picture is a just a bit soft. Our appreciation of the visuals and the story remains unhindered. The track is not distorted but it is a tiny bit muffled in places. Is it possible that the audio had to be pulled from a positive print? 1. Jarrico's version of events is taken from the book Tender Comrades by Patrick McGilligan and Paul Buhle. Howard Hughes put into production another Jarrico script called The Las Vegas Story, after, as the writer said, 'removing all the Jarrico poison from it.' Hughes also removed Jarrico's credit, which launched a crossfire of lawsuits between the writer, the mogul and the Screen Actor's Guild. Hughes won the suits, which for a number of years effectively gave studios the right to credit or not credit writers as they saw fit. When criticized, Hughes announced plans to go back through the RKO catalog and re-shoot title sequences where necessary to remove offending names. But that didn't happen. Jarrico's name stayed off The Las Vegas Story but remained on The White Tower. The writer would suffer a six-year work gap. His name would not be credited on a film for fifteen years. 2. No, not the other movie titled The Third Man on the Mountain. I really want to see Orson Welles as the corpulent penicillin salesman, clambering up Alpine ropes and yodeling at Billy goats. 3. (Spoiler). Everyone's 'mission' is fulfilled. The biologist accepts growing old, the author embraces his inadequacy, Carla exorcises her need to prove something to her father and Martin finds a reason to return to the States and get on with a postwar future. But poor Hein cannot let go of his illusions. 4. Our last view of the lonely, stark summit is certainly strange, with the heroes realizing that their goal is so close. The special effect shot reminds me of the marvelous pirate fantasy Fair Wind to Java, which ends with some daring treasure hunters climbing the last few steps to a legendary shrine on the side of the volcano Krakatoa. How many times did I as a kid tune in to the finales of both movies, half-expecting to see a different ending? 5. Judging by the range of colors on screen, is it possible that The White Tower was filmed on Ansco or Agfa color stock, and then sent to Technicolor for conversion? Eastmancolor was still a couple of years away, and the colors we see don't remind me of normal American hues. It seems like a huge expense for RKO to haul a Technicolor unit to France. Yet the film's title reads 'in Technicolor', not 'print by Technicolor'.